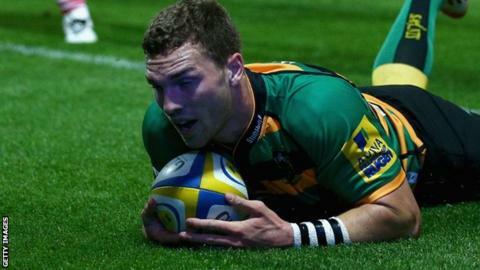 George North ran in a hat-trick as Northampton made an emphatic start to their Premiership title defence by blowing away Gloucester 53-6. Saints all but finished off the visitors in the first half, with two tries from Wales wing North either side of a George Pisi finish. Luther Burrell added another after the break and North plundered his third. Kahn Fotuali'i, Jon Fisher and Burrell contributed late tries to stun new Gloucester boss David Humphreys. Only Leicester and Wasps have ever won back-to-back Premiership titles in the play-off era, but this performance from Saints laid out their intention and capability to become the third side to pull off the feat. Last season was a breakthrough year for Jim Mallinder's men, who claimed their first-ever league crown and, by winning the European Challenge Cup, dropped the tag of nearly men by ending a run of four straight defeats in finals. Mallinder made just two signings over the summer, but the starting XV against Gloucester was entirely comprised of players involved last season, and they showed a swagger and confidence befitting champions. Gloucester are rebuilding under new director of rugby Humphreys, who replaced Nigel Davies in the summer following a disappointing ninth-place finish in May, but the process will take time. Internationals Richard Hibbard, John Afoa, Greig Laidlaw and James Hook all made their debuts, along with Jacob Rowan and, while they packed a punch in the tackle that they lacked last term, it came at the cost of fluidity and ruthlessness, something the hosts had in abundance. The early-season form of North is as promising for Wales as it is for Saints, the wing looking clinical and unstoppable at times, just 12 months before the next Rugby World Cup. Stephen Myler and James Hook had already exchanged penalties when the 22-year-old British & Irish Lion scored his first try, taking the ball from Burrell to cross in the corner. Myler, a man who has his own international ambitions with England, then laid on a superb second, using the space granted to him by an advantage to chip under the posts for the on-rushing George Pisi. Greig Laidlaw's penalty gave the visitors brief hope, but North ended any prospect of a fightback by superbly wriggling away from Gloucester tackles to touch down on the brink of half-time. Saints were relentless after the break and had the bonus point when James Wilson raced clear and slipped in Burrell, who looked strong all night up against Billy Twelvetrees, his rival for the England number 12 shirt. With Gloucester's Henry Trinder in the sin bin for blocking a tap penalty, North collected a Myler pass for his third and then replacements Fotuali'i and Fisher, the latter on his debut, both bundled over the line. Gloucester's embarrassment was complete when Ross Moriarty gave the ball away on the edge of his own 22 and Burrell crossed to cap a remarkable homecoming for the champions. "We can be pretty happy with that. We were guilty of trying to do too much in the last 20 or 30 minutes. "But from one to 23 in the squad we have to be pretty happy with that performance. It was the first game of the season and we set our stall out pretty early. "We want to make sure we're not one-hit wonders and that we can back-up being champions. We've made a conscious effort to work harder than last year and try and repeat what we did last year. "This would have been a tough place for anyone to come tonight on the first game of the season. After last season the boys wanted to set their stall out." "It was a good performance. You're always a bit nervous at the beginning of the season. "But we were good today. We played with tempo and defensively we were very physical. "We've never really mentioned being champions in the build up, it's all about how we want to play the game. Our attacking game has come on a lot." "Nobody likes to get beaten by that scoreline. But we said all through pre-season we wouldn't know where we were until we played 80 minutes. "After the first six games of the season we will be in a much better position to assess where we are and where we can aspire to be. But it was a tough night. "There has been a strong sense of optimism around the squad but we were playing the champions and you saw why they were first and we were ninth. "I thought for the first 20 minutes we were actually competitive and brought a physical edge. The disappointing thing from our part is we didn't make them work hard for the first couple of tries." Northampton Saints: Wilson; K Pisi, G Pisi, Burrell, North; Myler, Dickson; Corbisiero, Hartley (capt), Ma'afu, Lawes, Day, Clark, Wood, Manoa. Replacements: A Waller for Corbisiero (53), Denman for Ma'afu (53), Fisher for Manoa (53), Fotuali'i for L. Dickson (56), Foden for G Pisi (60), Hooley for Myler (67), McMillian for Hartley (67). Gloucester: Cook; Sharples, Trinder, Twelvetrees (capt, May; Hook, Laidlaw; Murphy, Hibbard, Afoa; Savage, Hudson; Kalamafoni, Rowan, Morgan. Replacements: Robson for Laidlaw (54), Dawidiuk for Hibbard (54), Palmer for Hudson (54), Moriarty for Rowan (62), McColl for Cook (64), Puafisi for Afoa (65), Atkinson for Twelvetrees (68), Y Thomas for Murphy (68).